Here Comes SuperHeroHype’s Review of Marvel’s Daredevil! There’s a lot that Marvel Studios gets right when they make their movies. They’re very true to their characters, the plots hit the beats of big storylines, they’re visually interesting, and more importantly, they’ve made us believe all of these things share a continuity. But one thing that is easily found in the source material that we don’t see in the movies are the normal people, the neighborhoods, and the rest of the world. Enter “Marvel’s Daredevil,” the first of five planned Netflix shows, which provides the exact storytelling boost that the MCU needed. “Marvel’s Daredevil” begins as one would expect, with the origins of Matt Murdock and his abilities, but from the beginning we’re thrust immediately into the accident that blinded Murdock and heightened his other senses. The opening ten minutes are a perfect encapsulation of the character as they showcase his origin, his commitment to his faith, his disturbance with the crime around him, and his abilities as a fighter. Not to mention the opening credits (with a brief teaser of his eventual red suit) are just perfect. Those opening minutes of the series feel like how any Marvel movie would function, establishing the character, his motives, and his style that makes him special, but once the roller coaster takes off from the station it’s like no ride Marvel has created yet. 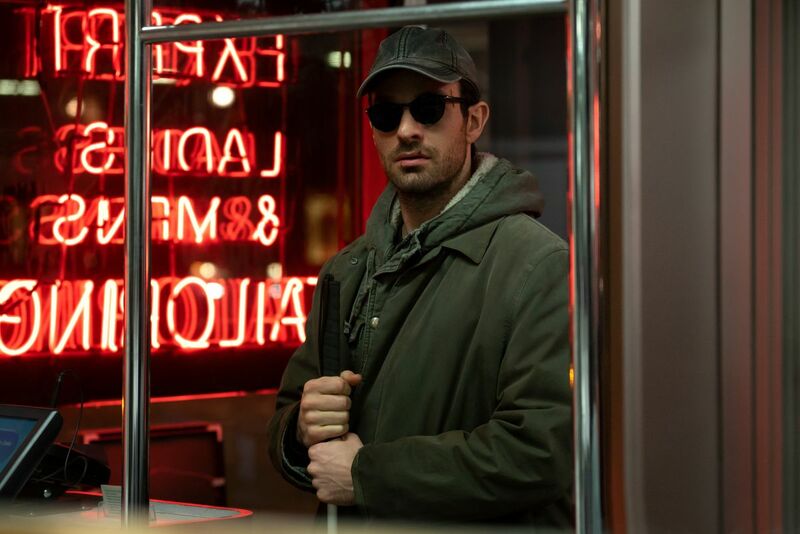 Charlie Cox takes on the role of the man without fear and leads the cast with the perfect blend of wit, charm, humor, and grit that make Matt Murdock live on the pages of comics. There’s a dichotomy to Daredevil that makes him one of the best comic book characters ever created and Cox captures it in his performance in the ways that he speaks in court vs. with his friends, how he moves as a the blind lawyer vs. as a vigilante, and how he makes the seamless transition between the two. All the cast members of “Marvel’s Daredevil” bring their A game and there’s not a weak link in the bunch, from Elden Henson’s hilarious portrayal of Foggy Nelson to the damaged Karen Page as brought to life by Deborah Ann Woll. Rosario Dawson as Claire Temple and Vondie Curtis-Hall as Ben Urich provide an even deeper root into this “Real world” of the Marvel universe, and elevate the story around them. Make no mistake, “Marvel’s Daredevil” is an ensemble piece. Executive Producer Steven DeKnight has carefully assembled a cast that works off each other with the intensity and chemistry that some shows can only dream about. There might be a few scenes in a row that don’t feature Charlie Cox as Murdock, but that doesn’t make them any less interesting or noteworthy. That’s why this series works so well, it’s not about one man, it’s about a neighborhood, it’s about the people, and it’s about functioning in your patch of grass in a larger world that doesn’t even notice you. Cox no doubt gets the bulk of the material in the show, his character’s name being in the title and all, but the drama on screen even when he isn’t present is still a treat. Visually, “Marvel’s Daredevil” is one of the best adaptations of a comic book I’ve seen, as the framing and depiction of the city look exactly like a Daredevil comic come to life. Citizens walk about their day, people ride the subway, cops talk to each other, it’s perfect. There’s also a level of action found in the series that reflects its comic book basis very well. 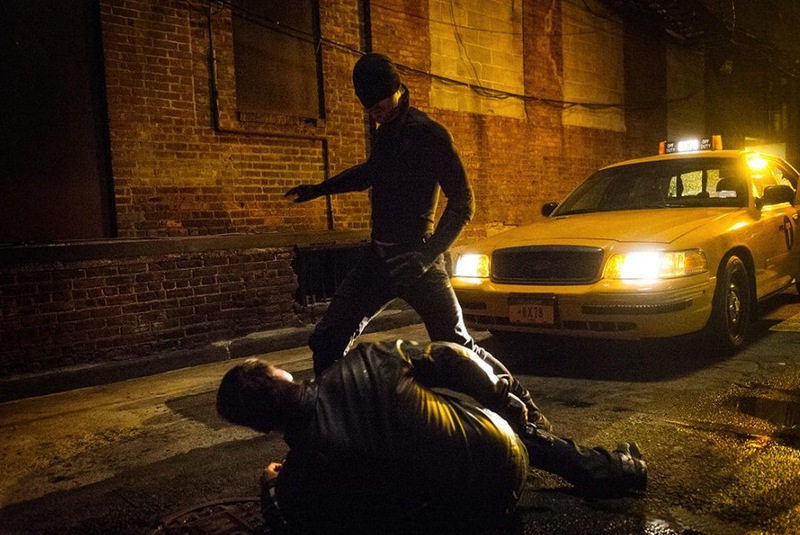 The way fights are choreographed reflects the scrappy and semi-grounded world of Daredevil. The shadow of Matt’s boxing father is felt as he knocks teeth free from criminals, but the way he bounces around and throws his cane look like comic book visuals in reality. It’s enough to turn this decades-long Daredevil fan into a little kid. I should also note, however, that the violence level in Daredevil reflects the nature of the story. This isn’t a big cartoon, so the punches are felt, the blood flows, and sometimes body parts are severed. In no way is it like a “Saw” movie, but there’s gore not found in any other Marvel production. Daredevil’s patented “Radar sense” is also included as a visual cue, though done in a less-obvious and potentially controversial way. I cannot applaud “Marvel’s Daredevil” enough. From its succinct telling of the origin, to the dynamic character drama, to the stellar fluid action, and the underlying through narrative, the show is another home run for Marvel. Drew Goddard’s script for the first two episodes is flawlessly put together with the same melding of reverence and new flavors that make the other Marvel products work. Executive Producer Steven DeKnight has developed a world within the Marvel Universe that is both unique and lived-in but also now integral to the scope of the MCU. If the rest of the Netflix shows are done with the same amount of heart, guts, and edge that “Marvel’s Daredevil” has, then there is nothing at all to worry about.